Welcome to Lakeland Toyota, where our team members are up-to-date on all the latest Toyota models and technological advancements and look forward to sharing their wealth of information with you! We encourage you to make the short trip over to our Lakeland, FL Toyota dealership today to experience how our high level of customer service will positively impact your shopping process! Our no pressure dealership leaves you free to leisurely stroll through all your available options and ask any and all questions. We're not looking to just sell you any car, we're looking to find the Toyota that complements your lifestyle, one that you'll enjoy for years to come! Prepare yourself to hit our showroom with confidence, drop by our finance department to go over all your viable car loan packages! We'll review your credit information and get to work finding the loan that doesn't stretch you financially, as well as an aggressive special that suits your current needs! Don't delay any longer, our friendly team eager awaits your arrival here at Lakeland Toyota! Do you have an adventurous spirit and you're in the market for a mode of transportation that can keep up? You've found it in the 2019 Toyota Tacoma! This new pickup will dominate the road ahead all while comforting you with some serious luxurious amenities! If you're not in the Lakeland area, utilize our online inventory system to start shopping through all your Tacoma trim options! Do a general search or input filters to narrow down your results; no matter which way you choose to shop, on-site or online, rest assured you're obtaining a dependable truck you can count on for years to come! Give us a call to schedule a test drive now! Don't let the paved roads dictate where life takes you, snag a reliable 2019 Toyota Tacoma and hit the road less traveled! 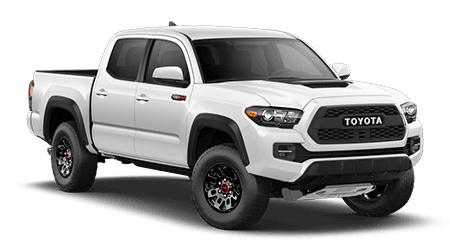 If you find yourself on some unsteady terrain frequently, then ask one of our dedicated professionals about the Tacoma TRD Off-Road's Crawl Control system that automatically modulates the throttle and brakes! There are five different low-speed settings available so you can focus on the road below while the Multi-terrain Select feature helps regulate the wheelspin. The Hill Start Assist Control is there when you need a little more confidence when moving forward and the locking rear differential works to ensure power is being evenly distributed throughout your ride. Experience this breathtaking vehicle for yourself, head over to Lakeland Toyota for a hands-on experience today! This truck will not only meet, but exceed your expectations! Don't deny yourself the privilege of a test drive, drop in now! Toyota constructed the new Tacoma with high-strength steel that is lighter than materials previously used and helps optimize safety. The available Atkinson-cycle 3.5-liter engine that boasts direct injection is sure to deliver you to your destination with ease. Make your way over from Brandon, FL today to start customizing your ride by choosing either the six-speed automatic transmission or the manual one for some serious control. Thanks to the available Tow Package you can take care of all your hauling needs with ease! Drop by to learn the details of this package and how you can get up to 6,800 pounds of towing power and carry a payload of 1,440 pounds! With the Trailer-Sway Control by your side you can hit the road with confidence! As you approach the new Tacoma on our lot, you may be stuck by the chiseled character lines and the muscular feel of this truck. The sturdy construction encases you in comfort and safety yet the Toyota Tacoma still keeps a strong sense of refinement. The available LED daytime running light will make your presence known as you navigate the city streets while the projector-beam headlights illuminate your way after the sun goes down. Learn all about the grade specific taillights that will leave a lasting impression as you cruise by. Don't miss your opportunity to own one of these models today, make the short trip over now and drive home in a brand Tacoma tonight! The Tacoma ensures you're able to handle all of your towing and hauling needs while the interior of the cabin looks out for your comfort along the way. The Smart Key with push start button will have you on the road in a flash while the Qi-compatible wireless charging station ensures you stay connected no matter where you roam! Pop your camera onto GoPro® mount to get some intense footage of your journeys! Roll down the windows and take in the fresh morning air as you crank up the Entune™ Audio system and listen to your favorite beats. With the Blind Spot Monitor you're able to confidently change lanes as you head home during that rush hour traffic. With the 2017 Toyota Tacoma, you won't mind those long hours behind the wheel anymore. The Tacoma pickup is constantly looking out for your safety while on the road. It hosts a slew of impressive features like the Star Safety System™ that comes with a variety of braking and traction systems to give you added control on the road. For added peace of mind, your new Toyota comes with ToyotaCare and includes 24-hour roadside assistance and a no cost maintenance plan, drop by to learn all the details today! Learn about all the different add-on warranties and features, like the rear parking sonar that helps you determine the distance between you and an approaching object. Head over for a test drive today and close the high-strength steel door to encase yourself in safety and comfort. We look forward to going over all these specifications with you soon! Don't hesitate any longer, your brand Toyota Tacoma is waiting for you here at Lakeland Toyota in Florida. We warmly welcome all our neighbors so if you're in the nearby areas of Brandon, Plant City or Winter Haven, make the short trip over to our Toyota dealership today to go over all of your financing options and our impressive specials! Our team eagerly awaits your arrival and the opportunity to serve you soon!